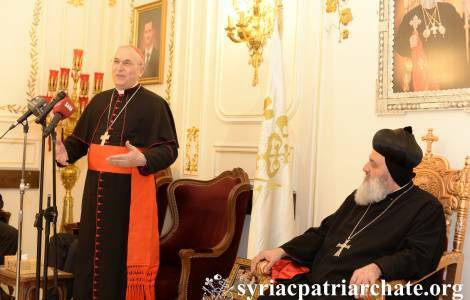 Damascus (Agenzia Fides) - On the occasion of the beginning of the new year Syrian Orthodox Patriarch of Antioch, Mar Ignatius Aphrem II, organized a reception to which all the diplomats accredited to the Arab Republic of Syria were invited. The reception took place on Tuesday, January 23 at the patriarchal seat, in Bab Tuma area, in the area of the Old City of Damascus. Cardinal Mario Zenari, Apostolic Nuncio in Damascus, and Faisal Mekdad, Syrian Deputy Minister for Foreign Affairs, together with ambassadors and diplomatic representatives from various countries were also present at the reception. Patriarch Ignatius Aphrem described 2017 as a year of suffering for the Syrian people, and expressed the hope that 2018 will mark the end of the conflicts and violence still afflicting Syria and the Middle East. The Primate of the Syriac Orthodox Church also thanked the ambassadors and their respective governments for their solidarity with Syria, appealing to the international community to put an end to all forms of external support for irregular militias and armed groups operating in Syrian territory.